Monday morning started with a 8:30 alarm so I could be awake for the rescheduled on-air interview. Tom Kief of the Tom & Emily Morning Show on 95 WIIL ROCK gave me a call at 9:40, and I talked on air about the mission to attend all 162 Brewers games. More importantly we discussed Be The Match and how easy it is to join the registry. I was on the show for about ten minutes, and afterwards I finished up the post for Sunday. I decided I was going to get lunch at Zip’s Cafe, which is just a few blocks from Prince’s apartment. The four parter below details Zip’s Cafe, and goes clockwise from top left. 1) The exterior of Zip’s Cafe, which is located on Delta Avenue, east of downtown Cincinnati. 2) The interior of the restaurant. 3) The back of the menu, as you can see, not much has changed, which is a good thing. I’m not sure how old the photograph is, but the restaurant opened in 1926. 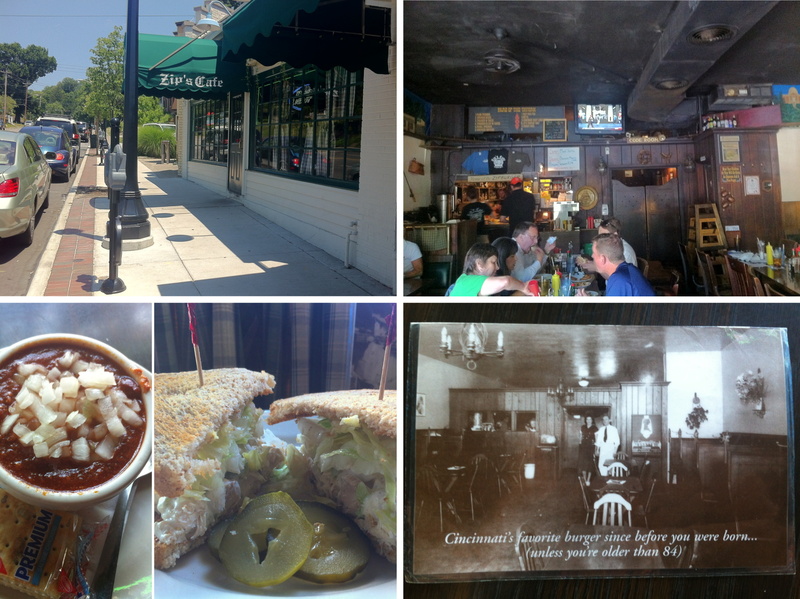 4) My lunch, I had a cup of Zip’s “Famous” Chili, and a chicken salad sandwich. I should’ve gotten the bowl of chili because it was delicious, and I was still hungry after finishing both parts of my meal. After lunch I walked back to Prince’s place and took it easy for an hour or so and then got ready for the game. Barry, a Brewers fan from Milwaukee who now lives in Cincinnati, had tickets for the first two games of the series. He works in the Bengals ticket offices, and I met him just before five to grab my ticket for the game. He had to stay a little longer at work and joined me later. 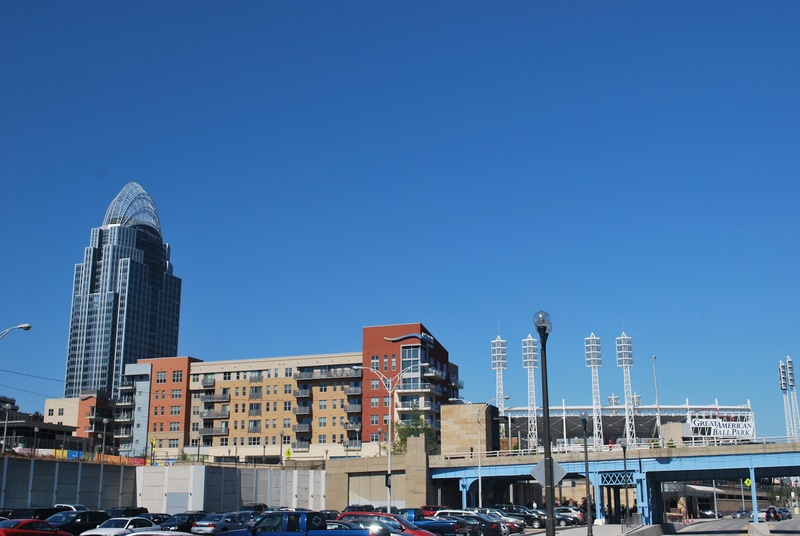 I parked and walked from Paul Brown Stadium towards Great American Ballpark, and the Reds’ home is hard to miss. You can see one of the exterior stadium signs on the right, as well as some of the light towers. 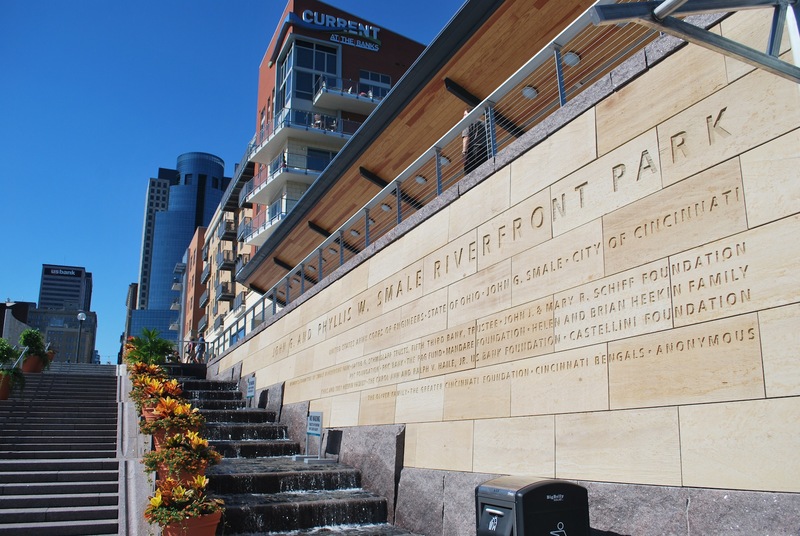 As you get closer to the stadium you come across the John G. and Phyllis W. Smale Riverfront Park. It has some nice water features, and seems like a relaxing place to pass the time. 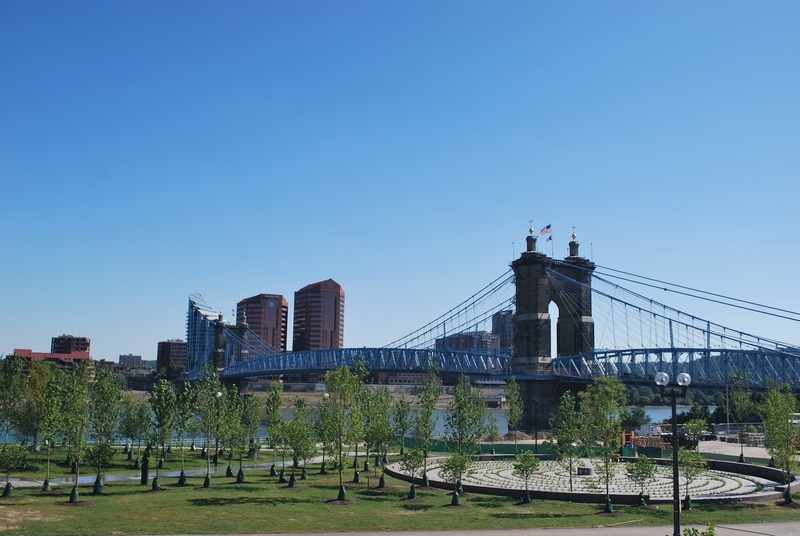 Once I got closer to the park I turned around and got a picture of the John A Roebling Suspension Bridge. 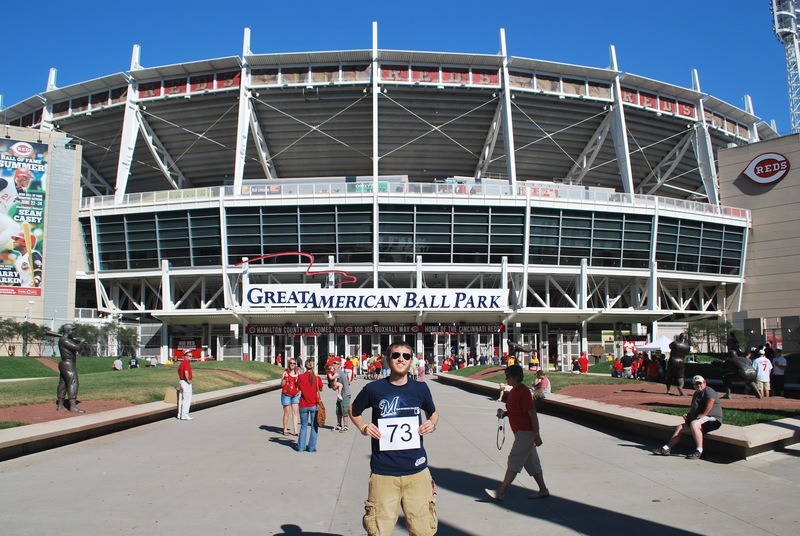 I then walked up to the stadium to get my game number picture taken. I had a Brewers fan take the picture at first, and I liked the last one he took, after having him re-take it three times. I didn’t like all the people in the background, so I waited until they opened the gates and had one of those fan-photo camera guys take a picture with my camera. I wound up not really liking those either, but I dislike this one the least. I went inside at 5:50 and walked around and took some pictures, while also taking in some of the Brewers batting practice. 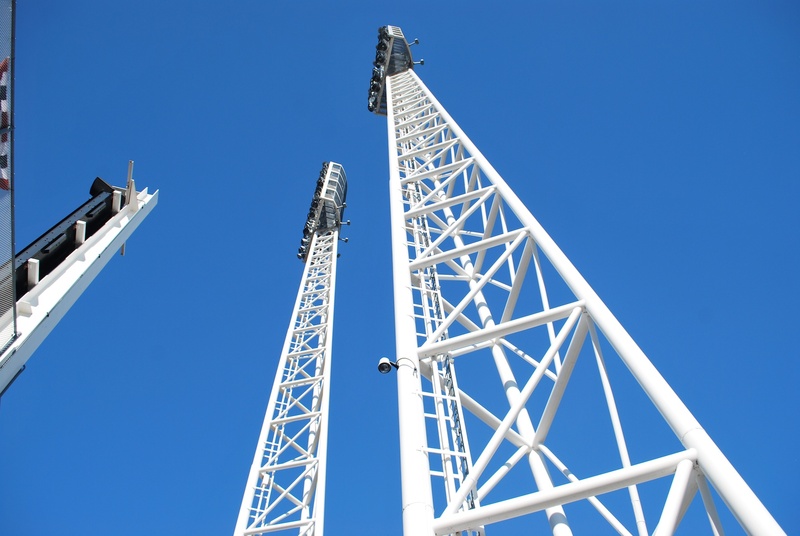 This is a close up look at the white light towers that are used at the park. 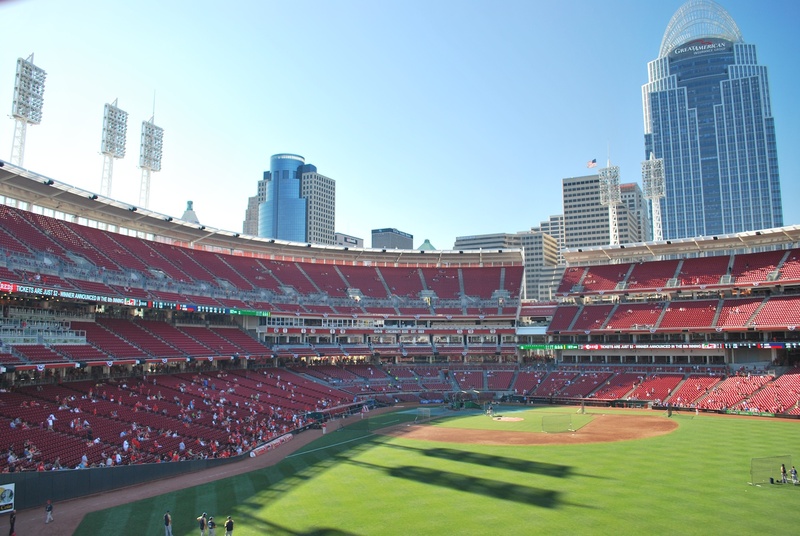 There aren’t any other parks that use as much white as the Reds do, and I kind of like it. I’m also someone who would just wear white t-shirts all the time if that was socially acceptable. I went to the top row of the “bleachers” in right field. I put bleachers in parentheses because they’re actually seats. The only bleachers are in the second level of seating beyond the left field wall. This is the view looking back at home plate. Great American Insurance Group bought the naming rights to the park, and you can see one of their buildings in the upper right of the picture below. The picture below is of the scoreboard and the smoke stacks that they shoot fireworks out of before games and after home runs. 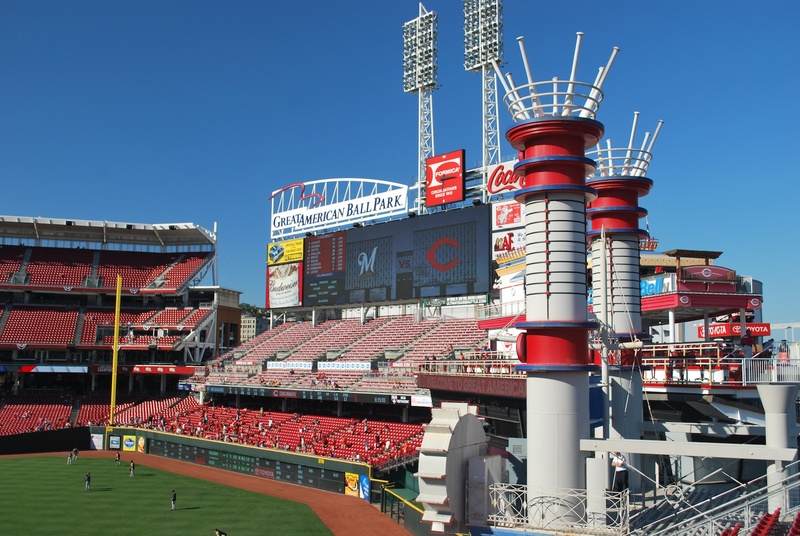 The structure is supposed to resemble a riverboat, and it’s a pretty cool feature at Great American Ballpark. The white baseball bats add a nice touch to the top of the smoke stacks. After batting practice I walked around a little, and noticed this guy signing a bunch of baseballs. 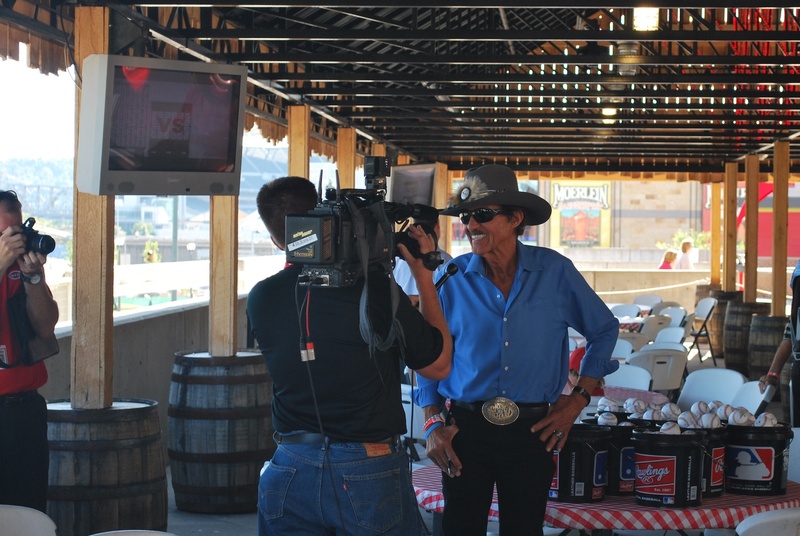 They had some NASCAR cars in the ballpark, and I was pretty sure it was Richard Petty. I overheard some other people talking and they confirmed my assumption. This coming weekend’s NASCAR race is near Cincinnati, so I’m guessing they were trying some cross promotion. There was a current driver signing baseballs as well, but I don’t remember his name. The two of them threw out ceremonial first pitches, and Petty’s was a 45 footer. I wasn’t impressed. I found my seat, and Barry met me before the game got underway. His friend Will (a Reds fan) was joining us as well, but he didn’t arrive until the fourth inning. This was the scene as Mat Latos delivered the game’s opening pitch to Aoki. The first inning turned out to be the Brewers best chance to score. They had runners on first and second with no one out and Braun at the plate, Ramirez on deck, and Chart in the hole. They managed to score zero runs. Gallardo was on the mound for the Brewers, and I got him as he was about to release the first pitch in the bottom half of the opening frame. Pretty much right when Will showed up the Reds pushed two runs across. They both scored in the fourth when Jay Bruce lined a double to left field. 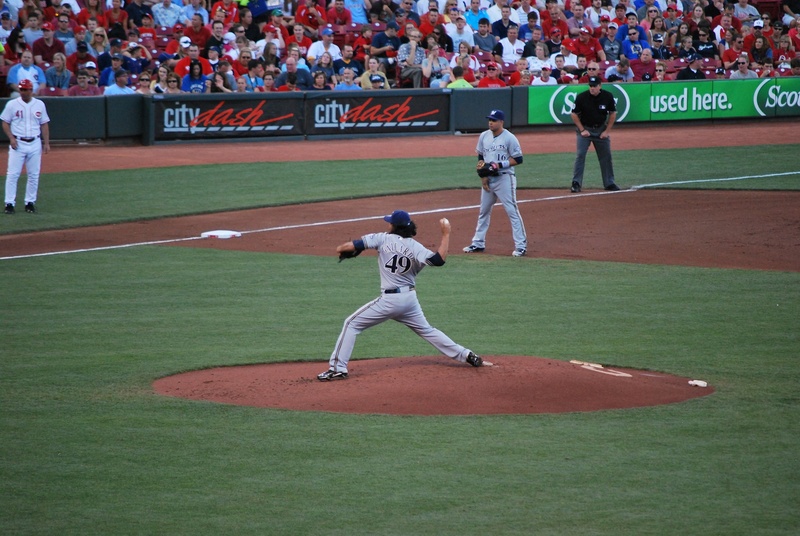 The Brewers avoided a second straight shutout when Aoki homered to lead off the bottom of the sixth. I like the Brewers fans standing and cheering in the upper left. 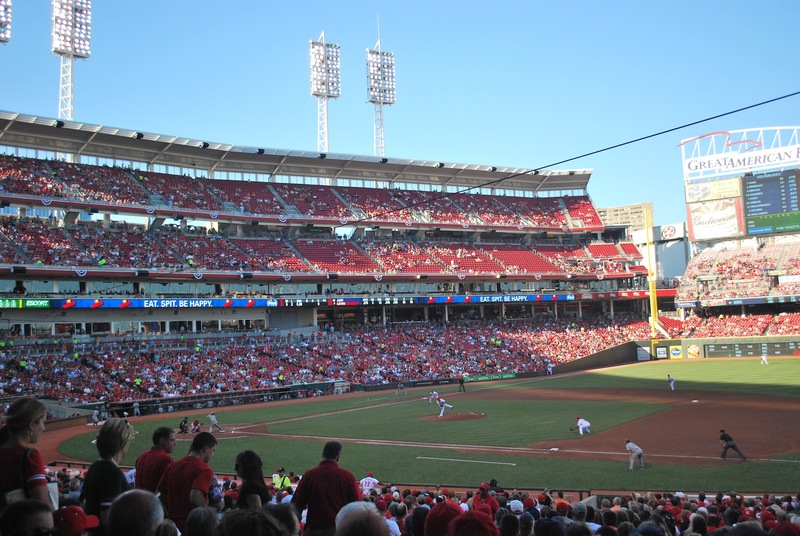 The Reds added a run in the eighth inning, and that concluded the scoring. Final Score: Reds 3 – Brewers 1. Mat Latos pitched a complete game four-hitter, giving up the one run, while walking two and striking out 13. Kroger gives ticket holders free pizza and ice cream if the team strikes out at least 11. 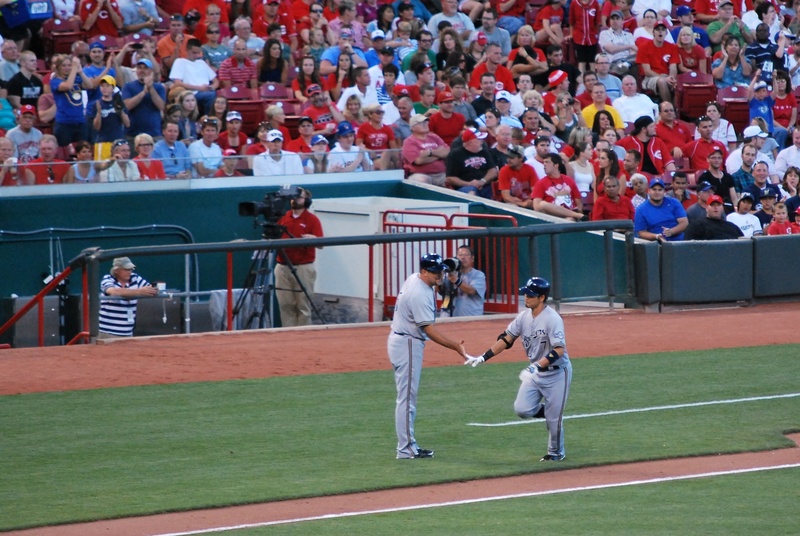 When the eleventh Brewer struck out the crowd erupted, louder than when they scored the two runs in the fourth. You have to exchange your ticket stub to get the freebies so I will not be partaking in the giveaway, and probably wouldn’t have done it anyways.